Want to watch 'Batman V Superman: Dawn of Justice' but don't have two hours and thirty minutes to spare. 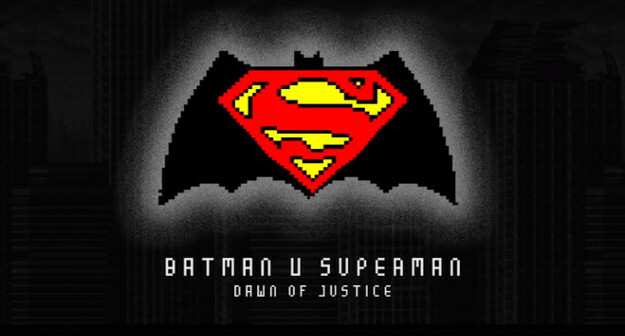 Well, Brazillian graphic artists BitCine has got you covered with an 8-bit video game version that covers the big moments all within four minutes. Watch Batman's unexplained "Knightmare" scene, Superman battle Bats through a building, and yes, it has the "Martha" scene. Who needs context and details? Honestly, the film could have edited some of those first act scenes like this version does. Still, the video gets down to the great action portions in glorious 1988-style video game graphics. Concerned about the actions of a superhero with godlike powers and without restrictions , the formidable and ruthless vigilante of Gotham City faces the most beloved savior of Metropolis , while all are wondering about the kind of hero that the world really needs . And with Batman and Superman at war with one another , a new threat arises , putting humanity at greater risk than ever known.